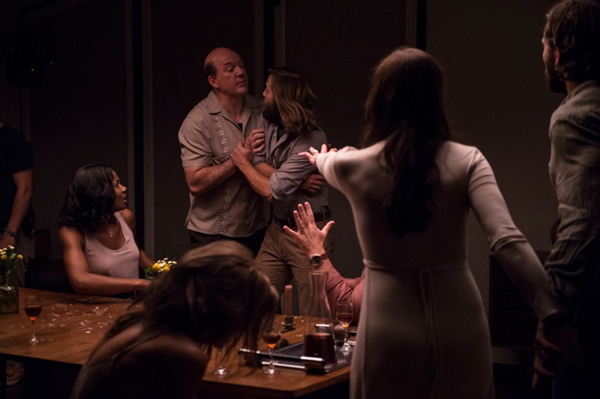 The Invitation is a super taut thriller with great direction and amazing performances and I invite you to come along and read this spoiler-free review...or I will sacrifice you to the Gods. Well...mostly spoiler-free. If you've been reading this dark little corner of the internet known as Film Deviant for any good length of time...then you will probably know by now that one of my very favorite sub-genres of horror is cult stuff. Specifically...satanic cult stuff...but, I do enjoy the various kooky religious cult stuff, as well. In the past 5 or so years there have been some truly interesting offerings from the likes of Kevin Smith and Ti West...as well as the really top notch segment from V/H/S/2 called "Safe Haven", which was directed from the super talented Gareth Evans. I still hold "Safe Haven" up as the standard for which all other modern cult film is judged by. I kid. I don't really like to judge stuff...but, if I did...Jesus..."Safe Haven" is the bees knees. The pickle jam made from Stan McMahon from East Birmingham. I dunno, dude....I've been a cornucopia of raw emotions ever since Prince passed on to the big purple Lake Minnetonka in the sky...so, forgive me if I seem all over the place with this review. 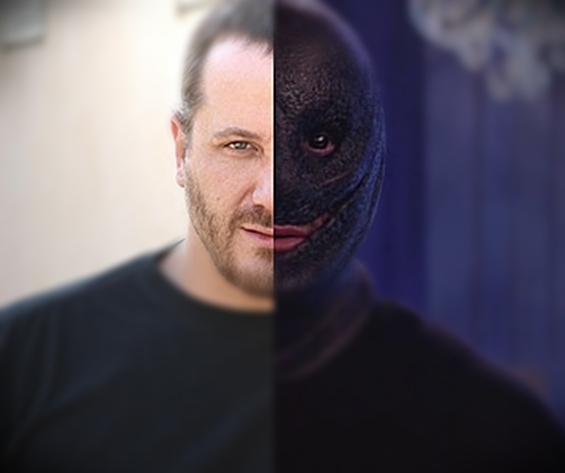 What would Tom Hardy do? 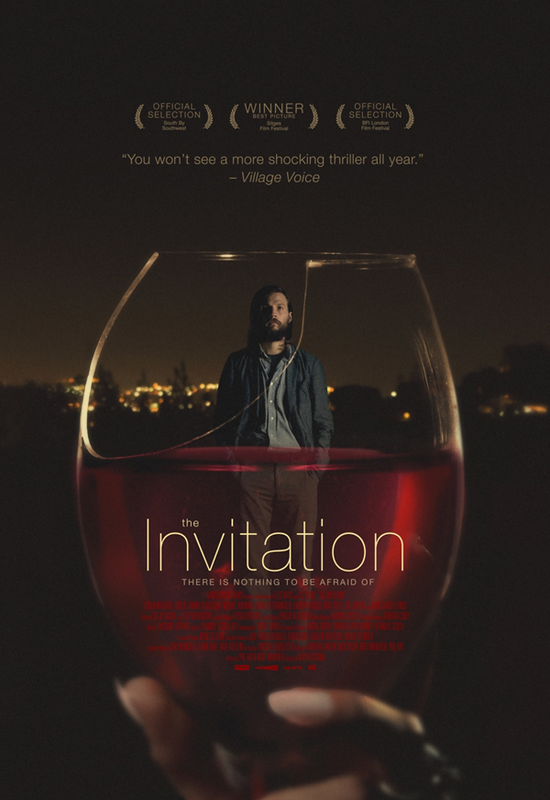 Ok...so, enter Karyn Kusama into the cult ring of fire...with her superb offering...The Invitation. You'll remember Kusama from the brilliant Girlfight, which pretty much introduced the world to the wonders of Michelle Rodriquez...who would go on to light the world on fire a quarter mile at a time in the Fast and Furious films...and not much else. She followed that one up with the big screen adaptation of Aeon Flux, a title that will get no more mentions here at Film Deviant...then the mixed bag that was Jennifer's Body. Personally...I loved Jennifer's Body. I don't care what anyone says about that film and Meghan Fox's inability to reach any true form of depth with her limited thespian abilities. The film is a great example of demonic teenage fun with razor sharp commentary from Diablo Cody, a name that gets a ton of groans to this day. Still...Karyn Kusama has always been a name that conjured up intrigue from true film fans...as she is a filmmaker with a certain style and potential to reach different levels of cinema and storytelling. The Invitation certainly corrects the course for her and re-establishes her as a filmmaking presence to behold. Perhaps all those years that she spent in TV land helped hone her skills for the big screen. Perhaps I'm going to walk over and flip to side two of LoveSexy. We may never learn the answers to these burning questions. 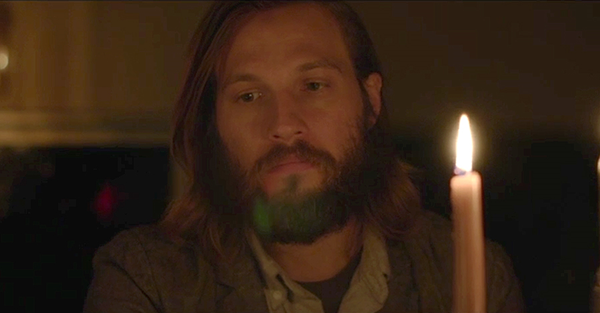 The Invitation introduces our two leads in the form of Will (a dude named Logan Marshall-Green, who incidentally wins the award for actor who could replace Tom Hardy in the event that 2016 swallows his mortality whole...just like it is swallowing up everyone else) and Kiri (the absolutely gorgeous Emayatzy Corinealdi...such a fun name) as they both drive to an old familiar house that Will knows all too well...because it used to be his and his former wife's, who has invited the two of them over for a sort of reunion. All of the guests soon learn that all is not what it seems as we find out that Will's ex, Eden (played with an emotional depth by the talented Tammy Blanchard) has coped with the loss of their son with the help of a cult that she discovered in Mexico. I won't say anymore...because what follows after that revelation is a series of tension-wrought events that leads us down this spiraling vortex of desolate abandon and emotional torment. It is a ride best served as cold as possible...because half the fun is guessing what will come next. As a matter of fact...why in the hell are you even reading this review, dude? I already kinda spoiled some of the particulars by mentioning the weird cult stuff. Sorry. (Not sorry). Ok, ok...I'll try the veal parmesan...sheesh. I will say that writers Phil Hay and Matt Manfredi do expert work of not getting too heavy-handed with the flashbacks of the tragic events that befell the young couple prior to this particular evening's reunion. They also do a great job of mixing in the nervous laughs with the dead serious stuff...so, everything feels as organic as possible...helped, of course, by Kusama's pitch perfect direction and the stunning cinematography by Mr. Bobby Shore. The film's sound design should also be noted as being quite exceptional, punctuating the sublime quiet moments with the arresting, in-your-face harshness of cold reality. The entire film feels like the perfect harmony of artists working together to create one beautifully suffocating experience. In the way of detriments...the film is not without a tiny few. It often takes its sweet time to really get going...hitting a few "false starts" along the way. And once we finally get to the third act...I wish we were treated to much more brutality, as things get a tad bloody here and there. The film just felt a bit on the light side of horror until we get to that brilliantly staged final shot. Getting to that great finale sometimes feels a little too familiar as it gets a smidge predictable at times. The Invitation is a surprise of a thriller...from a filmmaker who has obviously learned quite a bit in terms of restraint and delivery. It is a fine result from a group of artists at the top of their game all telling the same story through each of his and her filters. It is a gorgeous display of dread not to be missed.